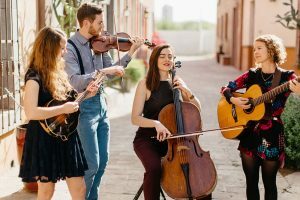 With a unique sound, rooted in the traditional music of the Appalachian South, Americana quartet Run Boy Run blends bluegrass, folk and the old-timey American styles with touches of classical and turn of the century details. Their four studio albums brought them to the attention of the folks at NPR’s A Prairie Home Companion, where they have performed twice. The have also have garnered praise from the likes of All Music Guide, Performer Magazine, PopMatters, The Guardian, and more. The band is brother and sister Matt Rolland (fiddle, guitar) and Grace Rolland (cello, vocals), sisters Bekah Sandoval Rolland (fiddle, vocals) and Jen Sandoval (mandolin, vocals). With three strong female voices, singing separately and in harmony, and deeply rooted familial connection to traditional American music, Run Boy Run didn’t come recently to their sound; it’s in their collective blood. Existing comfortably in the tension between tradition and the contemporary musical frontier, Run Boy Run continues a sense of innovation seen by bands such as Nickel Creek, Crooked Still, and The Wailin’ Jennys, a journey into music that is dynamic, orchestral, and brimming with beauty. From winning the band contest at Pickin’ In The Pines (mere weeks after forming in 2009) to a special appearance at the Telluride Bluegrass Festival in 2012, Run Boy Run has been making fans across the U.S. with their open-ended musical approach and dynamic stage presence.